Would you like to have complete control over your website's content? 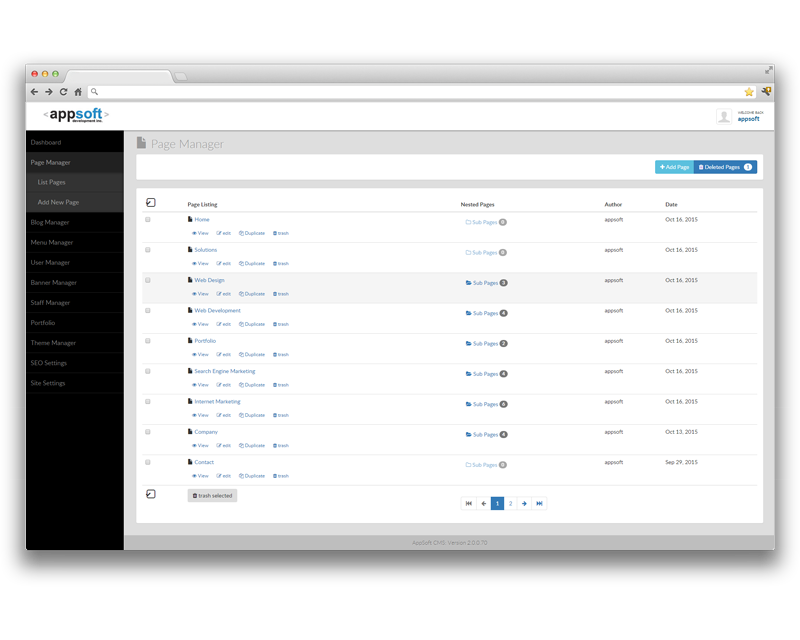 Our content management system (CMS) allows you to make menu changes, remove or add pages, manage marketing banners, change staff pictures and bios, and much more. Plus, we'll train you and your staff how to manage the easy-to-use back-end database. That way, you never have to worry about site changes because you have total control. Getting the attention of online visitors is important. Keeping them fully engaged is critical. That's where quality content management systems come in. Simply put, Appsoft's CMS is an application that allows for publishing, editing and modifying content on your website. 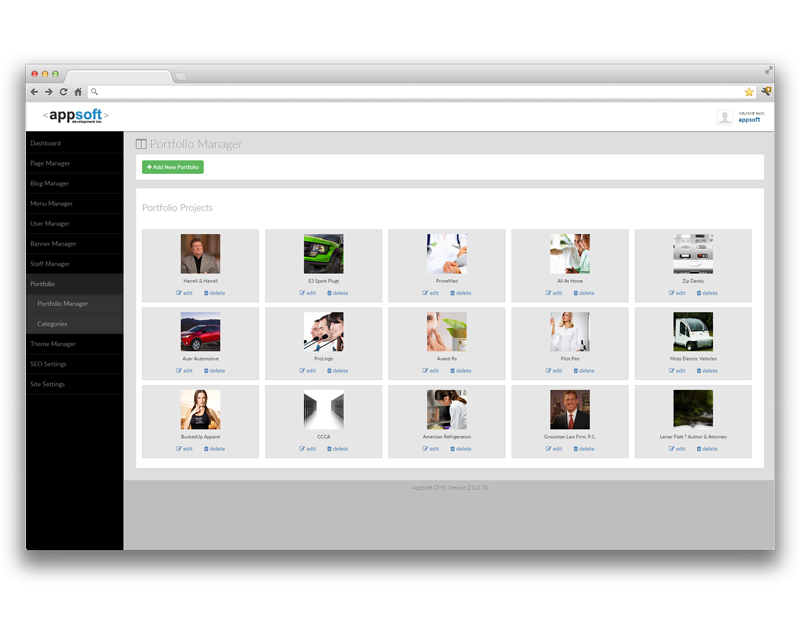 Examples are blogging systems, photo and video galleries, and e-commerce systems. Content: Quickly manage the content (copy, images, bullet lists, quotes, etc.) for your website's pages by accessing your site's database modules. 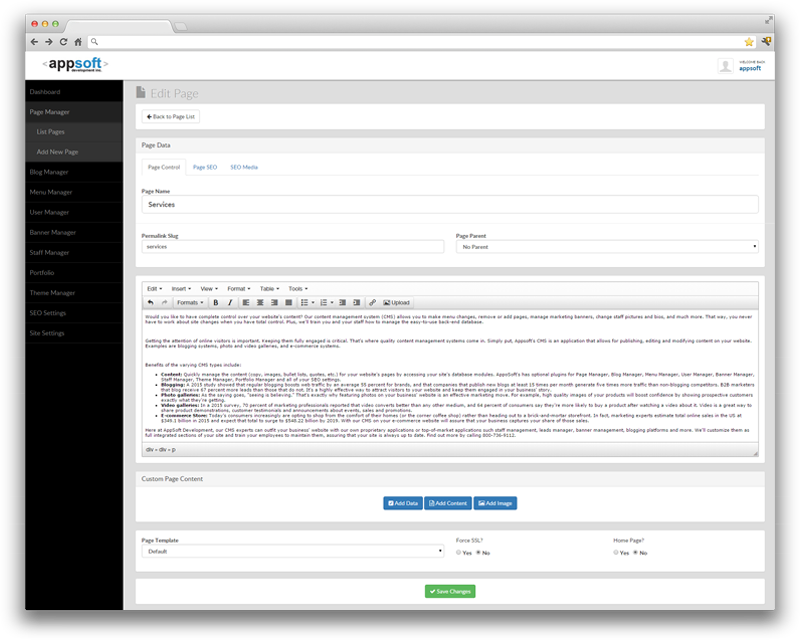 AppoSoft has optional plugins for Page Manager, Blog Manager, Menu Manager, User Manager, Banner Manager, Staff Manager, Theme Manager, Portfolio Manager and all of your SEO settings. Blogging: A 2015 study showed that regular blogging boosts web traffic by an average 55 percent for brands, and that companies that publish new blogs at least 15 times per month generate five times more traffic than non-blogging competitors. B2B marketers that blog receive 67 percent more leads than those that do not. It's a highly effective way to attract visitors to your website and keep them engaged in your business' story. Photo galleries: As the saying goes, "seeing is believing." That's exactly why featuring photos on your business' website is an effective marketing move. For example, high quality images of your products will boost confidence by showing prospective customers exactly what they're getting. Video galleries: In a 2015 survey, 70 percent of marketing professionals reported that video converts better than any other medium, and 64 percent of consumers say they're more likely to buy a product after watching a video about it. Video is a great way to share product demonstrations, customer testimonials and announcements about events, sales and promotions. E-commerce Store: Today's consumers increasingly are opting to shop from the comfort of their homes (or the corner coffee shop) rather than heading out to a brick-and-mortar storefront. In fact, marketing experts estimate total online sales in the US at $349.1 billion in 2015 and expect that total to surge to $548.22 billion by 2019. Our CMS on your e-commerce website will assure that your business captures your share of those sales. Here at AppSoft Development, our CMS experts can outfit your business' website with our own proprietary applications or top-of-market applications such staff management, leads manager, banner management, blogging platforms and more. We'll customize them as full integrated sections of your site and train your employees to maintain them, assuring that your site is always up to date. Find out more by calling 800-736-9112. With AppSoft's content management system modules, clients enjoy both a high-quality, custom designed website and the ability to add, update and delete content as needed. We can also customize modules for blogs, photos, videos, lead manager, staff manager, e-commerce and more as fully-integrated sections that do not pull traffic away from your website. We build you a customized CMS, then show you how to maintain it, giving you the freedom to update portions of your website as changes happen in your business. This will help your organization manage documents, contacts, videos, pictures, calendar, and more. Additionally, modules can be customized to suit any business or industry requirement. AppSoft will personally train you and your staff on creating and updating content pages; managing menus; blogs or news pages; staff manager; adding, grouping and publishing photos and videos; uploading products for sale, assisting customers through the sale and following up afterward. To find out more about our content management systems, call 1800-736-9112 or use our online email form. Contact us and get an accurate quote for your project. More than 1000 completed projects in 14 years.